Adidas Boost is 5 years old! I know, right? When this running-specific trainer tech first appeared way back in 2013, you probably said, "Well, this looks kind of like polystyrene, can't see it catching on, any more than Adidas Spring Blade, from 2013 did." Shows what YOU know, homes. With Yeezy Boost and NMD helping propel the energy-returning sole to the catwalks and urban streets, and runners loving it, Boost is everywhere. And now the 5 years of Boost anniversary pack is here with the Energy Boost OG, Energy Boost and UltraBoost (limited-edition). To celebrate the big 5, the running shoe that launched the Boost line (Energy Boost) has been updated and re-released in its original black and yellow, bee-flavoured colour-way. Also in the anniversary pack are "Adidas’ most iconic and loved silhouettes", the Energy Boost OG, Energy Boost and UltraBoost LTD.
Boost refers to the aforementioned, home-tech-packaging-material-esque material in the sole. It adds lightweight cushioning technology and excellent energy return "for every single stride," and has been worn by everyone from marathon world record-breakers, Mary Keitany and Dennis Kimetto to demented rhythmic shouting genius, Kanye West. 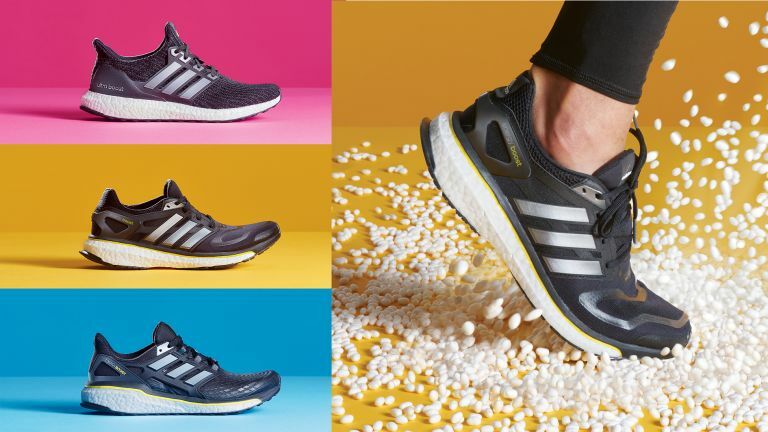 These shoes all have Boost gas in the sole and midsole – in fact there is "85% more" of it in the new Energy Boost than was in that first shoe, way back in 2013 – to store and return "superfast, lightweight energy" but it's the silhouette of the shoes that probably really ensured their success. • "Improved and simplified midfoot construction combined with a lighter cage for a more accommodating fit." • "Updated Torsion System for a smoother landing and midfoot support push-off." • "Enhanced Techfit with a foot-hugging upper with zoned elastic support in the forefoot, identified using Aramis research and testing, provides superior comfort and a snug feel." • "Stretchweb is new to the Energy silhouette, with a Continental rubber outsole adapting to every runner’s foot strike by moving in harmony with Boost to provide a smoother, more flexible and enhanced grip." They all look suitably iconic and edgy, five years on, in stark contrast to your haircut from that year. • All three of the new Boosts will be available from Thursday February 1 2018 in Adidas stores worldwide and online at Adidas.com. Pricing is in euros only so far: Boost OG €150, Energy BOOST €160 and UltraBOOST LTD €200.